Venture out of the city with trips to Bunratty Castle and Folk Park (in Bunratty), Ballyvaughan (Burren Birds of Prey Centre & Aillwee Cave) and Cliffs of Moher (in Liscannor). Spend the 28th (Fri) among the memorable landscape of The Burren. Next up on the itinerary: explore the wealth of natural beauty at Connemara National Park, get to know the fascinating history of Salthill Promenade, admire the landmark architecture of Galway Cathedral, and stroll through Salthill Beaches. For other places to visit, traveler tips, reviews, and other tourist information, go to the Galway travel planner. Zurich, Switzerland to Galway is an approximately 7.5-hour combination of flight and bus. You can also drive; or take a bus. The time zone changes from Central European Time to Greenwich Mean Time, which is usually a -1 hour difference. In April in Galway, expect temperatures between 15°C during the day and 6°C at night. 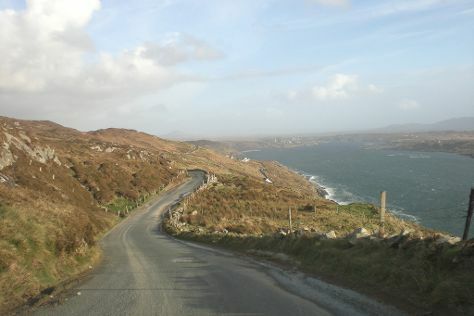 Cap off your sightseeing on the 1st (Mon) early enough to go by car to Clifden. On the 1st (Mon), don't miss a visit to Sky Rd and then admire the natural beauty at Kylemore Abbey & Victorian Walled Garden. Keep things going the next day: find something for the whole family at Westport House & Gardens and then explore the landscape on two wheels at The Great Western Greenway. To find traveler tips, reviews, other places to visit, and tourist information, you can read our Clifden trip planner. You can drive from Galway to Clifden in 1.5 hours. Alternatively, you can drive; or take a bus. In May, plan for daily highs up to 18°C, and evening lows to 9°C. On the 3rd (Wed), you'll travel back home.